The Palestinians ask that the Court order the US to move the embassy from Israel’s capital city, despite the fact that neither Israel nor the US have accepted the Court’s jurisdiction. Not mentioned in the Palestinian claim is that multiple diplomatic missions are located in territory claimed by the Palestinians, despite that territory still being under dispute and no official state of Palestine being established by international law. US President Donald Trump has repeatedly argued that the embassy in Jerusalem recognizes the “obvious” reality that Jerusalem is Israel’s capital. In addition to Israel’s historical ties to Jerusalem and the facts on the ground, the overwhelming majority of the widely accepted peace plans for Israel and the Palestinians would keep part of Jerusalem under Israeli control. The legal maneuver is the latest anti-US move taken by the Palestinians. Previously, Palestinians leaders have publicly slammed the United States and rejected the American peace plan before even seeing it. The Israelis have had an opposite approach to the Americans. 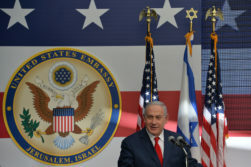 Prime Minister Benjamin Netanyahu raved about US support last Friday in comments to US Ambassador to the United Nations (UN) Nikki Haley, which were published by his office. Netanyahu told Haley that the United Nations “still permeates with the stench of anti-Israel and anti-Semitic resolutions, which are the same. And I want to thank you for clearing the air out of that hall.” He listed US support of Israel in dealing with multiple UN agencies that have engaged or tried to engage in anti-Israel actions, as well as UN resolutions condemning Hamas.